Dr. Wudyalew Wondmagegn, associate professor of electrical engineering at Frostburg State University, and Dr. Howard Katz, professor of materials science and engineering at Johns Hopkins University, are combining their expertise to improve OSC vapor sensor tech. Their collaborative inter-university research project is supported by a three-year $438,463 grant from the National Science Foundation, approximately $160,000 of which will fund research at FSU. OSCs are small, simple inexpensive to produce and as mechanically flexible as plastic. However, environmental factors like heat, humidity and other gases can degrade the current OSC vapor sensors in as little as a few hours, causing readings to drift. That drift renders them unreliable in most real-world situations. Wondmagegn and Katz are developing strategies to overcome or counteract those drifting outputs. The two teams will test changes to the materials and design of individual OSC vapor sensors to optimize performance, collaborating regularly to refine their improvements. At FSU, Wondmagegn’s students will deploy computer models to simulate those sensors in service. Wondmagegn and his team will then design circuits of sensors to preserve sensitivity while minimizing output drift. At JHU, Katz’s team will physically produce various OSC sensor designs and collect experimental data on actual sensor performance over time. The research project will also include STEM outreach efforts to high school students, both in Western Maryland and in Baltimore. For more information, contact Wondmagegn at wwondmagegn@frostburg.edu. 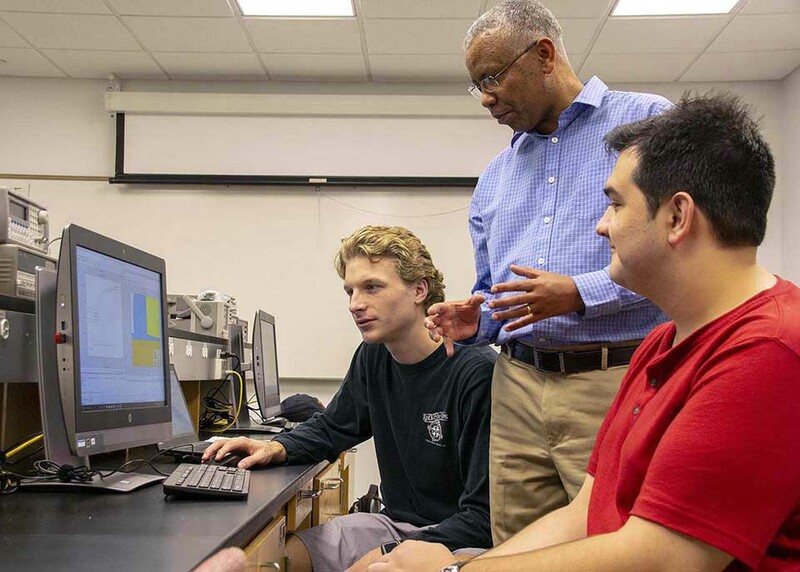 Dr. Wudyalew Wondmagegn, a Frostburg State University engineering faculty member, center, with his students, Nicholas Baicar, left, and Spencer Hamblin, will deploy computer models to simulate vapor sensors as part of a National Science Foundation Grant in collaboration with Johns Hopkins University.